You guys – I’m sorry for a second that I have to be a typical Midwesterner and complain about the current state of our weather. But, what the heck is going on?! I know that I live in Northern Wisconsin, but 30 F as a high for mid-April and random bouts of snow showers is just not okay. This usually is my favorite time of year because the sun is shining daily, and the temperatures finally are warm enough to sit outside and catch a few rays (with sunscreen on, of course!). While I don’t think I’m alone in this notion, I know that for me personally, I feel a heck of a lot better about myself and more confident when I’m able to get some sun and have a little bit of a tan. Well, since that clearly isn’t happening the natural way anytime soon, I’m turning to the next best thing. I have been a fan of JERGENS® moisturizers since I was in high school. I remember that when I finally quit going to the tanning bed (the horror, I know), my mom got me hooked on using JERGENS® to still have a healthy glow to my skin. The products since have come such a long way and are better than ever – there’s something to suit every skin type and color! And, all the products easily can be found at your local Wal-Mart. Since I’m pretty desperate for some color (and fast! ), I’ve been reaching for the JERGENS® Natural Glow® 3 Days to Glow™ Moisturizer. I use the shade Light to Medium since I’m pretty pale and want to gradually work up to a deeper, darker tan. 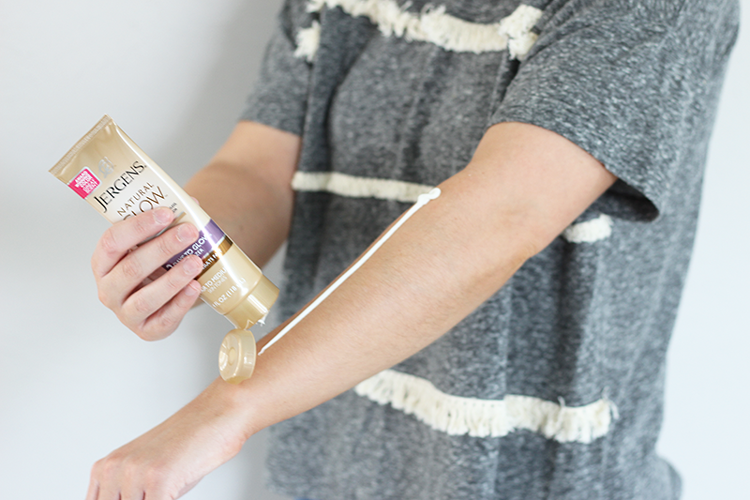 Instead of guesstimating how much glow moisturizer to put into my hand for application, I simply dispense the glow moisturizer in a straight line down my arms, legs, and anywhere else I want to apply it. I usually use a self-tanning mitt to make application quick and simple. And, I always use the gradual glow moisturizer sparingly around my elbows, knees and ankles. I make sure to blend the product in elsewhere first, and then whatever is leftover on the mitt I just lightly and quickly go over those areas to even things out. If you’re not using a self-tanning mitt, make sure to wash your hands right away after application to avoid any leftover glow moisturizer on your hands. 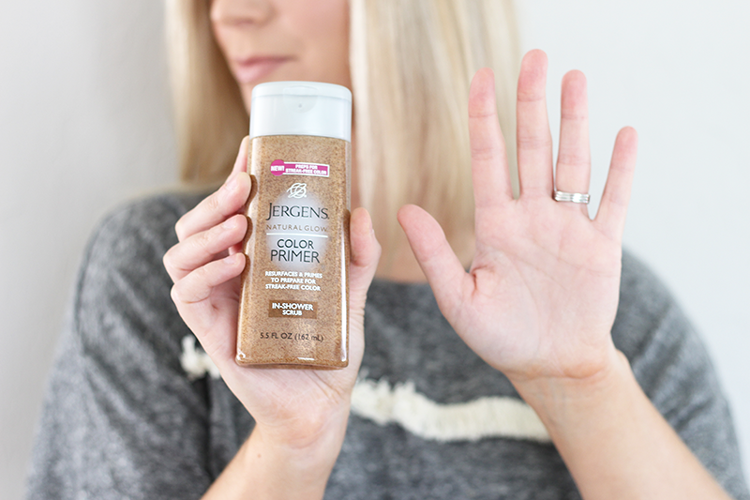 If you do have some color stain on your hands, apply a small amount of the JERGENS® Natural Glow® Color Primer In-Shower Scrub to your hands, rub them together, and wash your hands like normal. That should do the trick to remove any excess color from your hands! Albeit not a permanent replacement for the actual sun (if it ever decides to show up), the gradual glow moisturizer has helped me create my own sunshine. Now, if we could just get Mother Nature on our side, we’d be golden. What JERGENS® products have you used over the years or recently? If the weather is nice by you, send it my way! i totally feel you on the weather. so rude. i am so intrigued by this stuff, but i have had many bad self tanning experiences with elbows, knees etc and i really don’t mind being pale haha. I’m telling you that this stuff is fool proof. 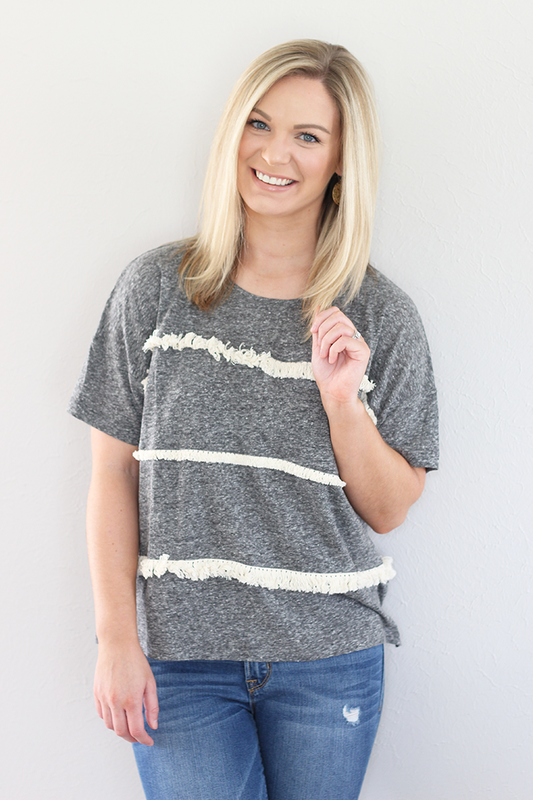 And if there’s extra color that you want to get rid of, that scrub takes it right off. 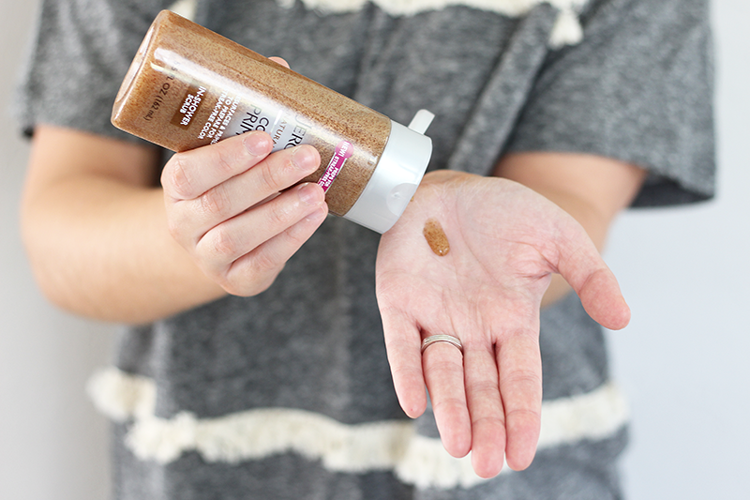 I’ve never been a self-tanner fan, but this makes it ridiculously easy. But I totally embrace the paleness, too lol. I actually just started using Jergens the last month and LOVE it! I tried it once a few years ago and couldn’t get past the smell, but they’ve really stepped up their game since! Yes, they have! I think the smell has improved a lot, too. I need to get me some of this! It most definitely isn’t “lay outside and bronze” weather here right now either and I’m feeling quite pale! I hear you, friend! This stuff has been a life-saver. This is such a good review! I haven’t used Jergens in forever– I tried the bb body last year and it didn’t work out for me, but the color-primer scrub looks awesome. 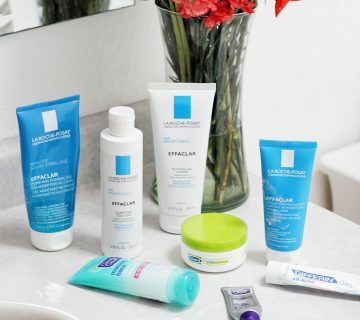 You should give these products a go, they are way different (and better) than their previous products. And, the natural glow line really gives just that – a very natural-looking color. The scrub is great! I use Jergens all the time! It’s the best. That is a great idea – I’ll have to try that combo out! 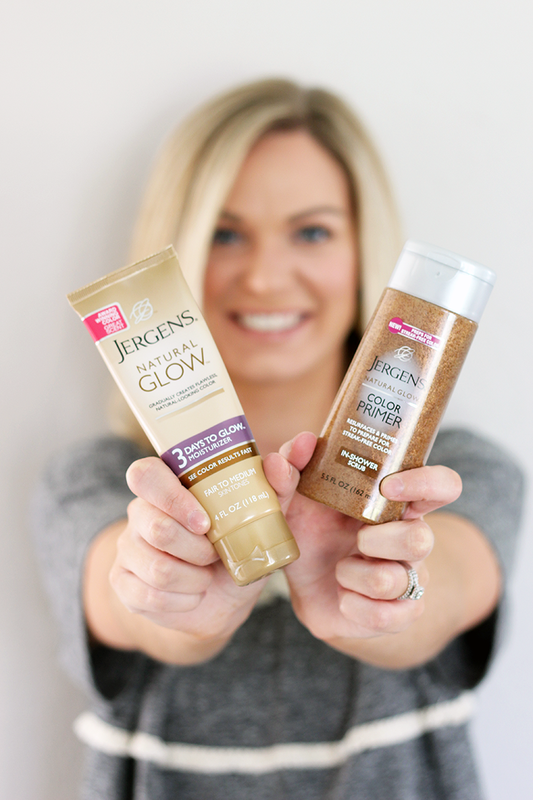 I haven’t ever used the Jergen’s Natural Glow products, but I’ve heard such wonderful things about them! I love the fact that you used a tanning mit to help keep everything even. Such a great idea! Yes, the tanning mitt makes such a huge difference! And, you minimize all the extra product on your hands. So sweet, thanks girl! And yes, please send the nice weather! LOVE Jargens. They make such great products! Right? Some of the best! 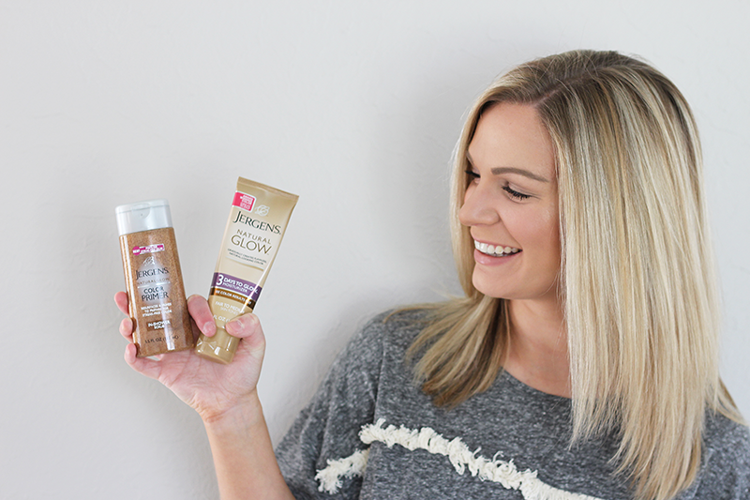 I haven’t used the Jergens Natural Glow products in awhile, but you’ve inspired me to try them again! Especially the scrub, time to get rid of my winter dry skin. Hopefully we’ve turned the corner on the weather! I think you’d like both of these products, I’m happy with the results! Haha it does kind of smell that way! That color looks so great on you! Really natural and not streaky at all. Definitely need to look into this one! Thanks, lady! Yes, I haven’t had any issues getting an even application. 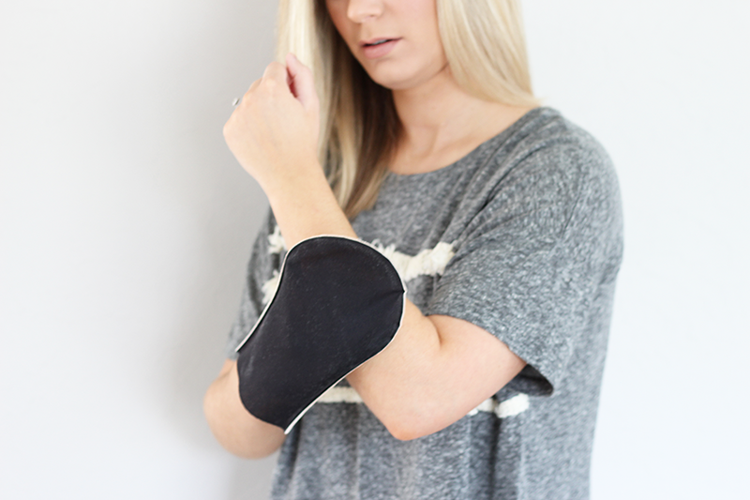 The mitt makes it foolproof! 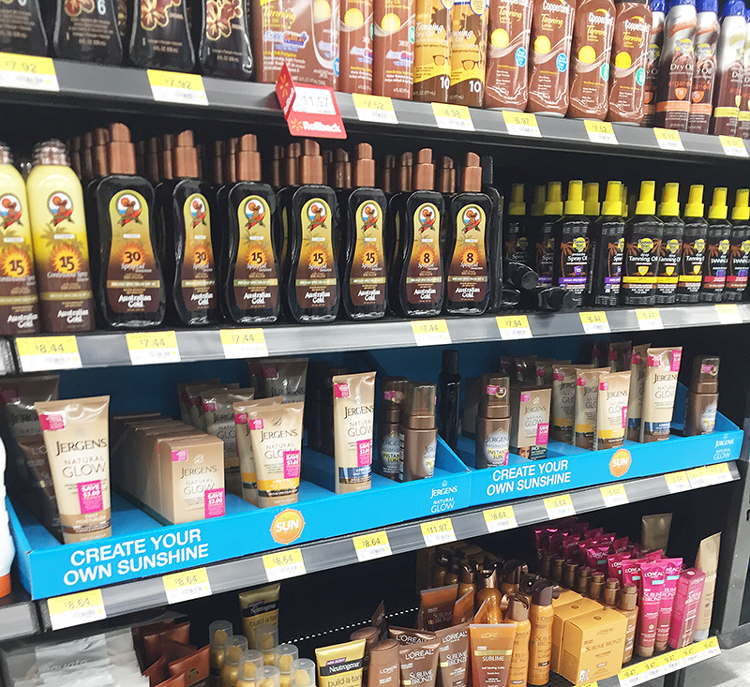 The instant sun is next on my list to try! 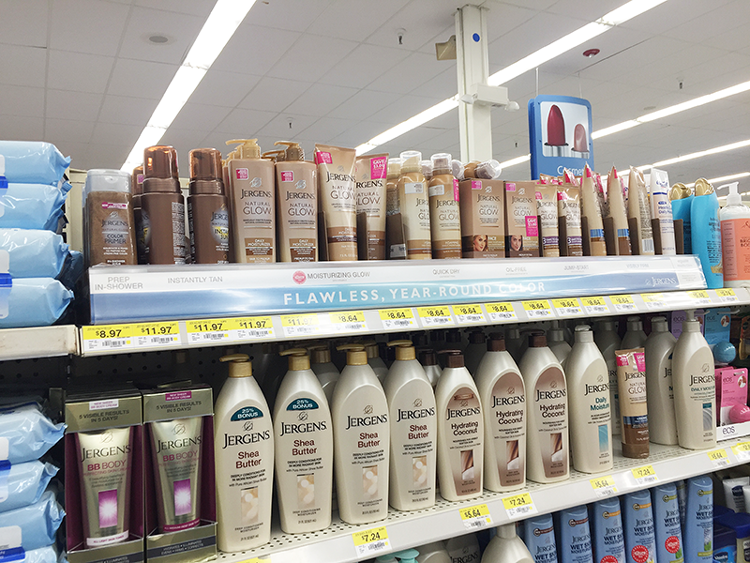 Jergens has great products in their Natural Glow Line, big fan of their products. They are great products, I agree! It works great pre-self tanning and to get that excess color off like I showed – I was impressed!